What is a typical day like for a sixth grader at BASIS Independent Fremont? 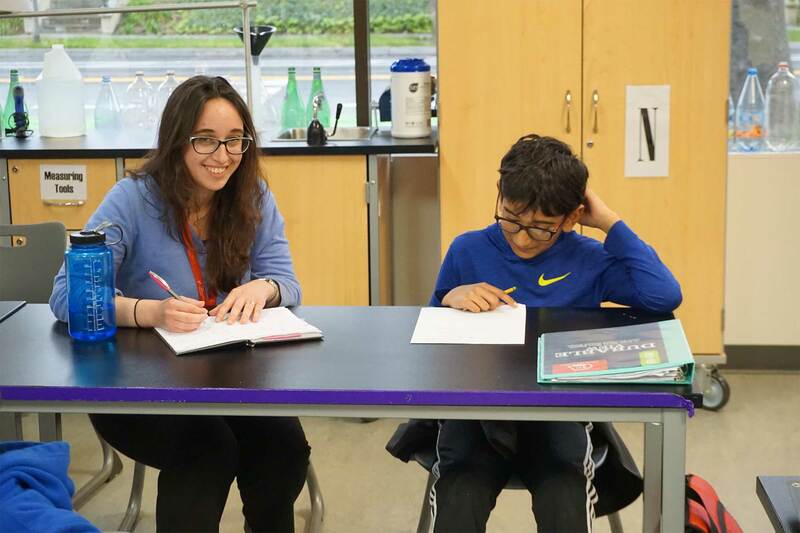 Ms. Sagal, a Subject Expert Teacher who teaches Latin as a sixth grade language elective and the sixth grade Academic Enrichment class, followed several of her students around for the day to see the school from their perspective. Read on to discover what she learned from them! A 6th grader’s day starts before classes even begin. Most of the students were already in the cafeteria for Early Bird, or were trickling in after I came. But this wasn’t just time for chatting—students finished homework, met with teachers, or talked each other through difficult questions from class. A few students helped me figure out the schedule I had been given—I was a “shadow student” after all! The first class of the day was World History with Dr. Monkman. The students were examining and analyzing a primary source document, the Heiji scroll, which documents a battle involving samurai. They began by reviewing information about Bushido, a samurai’s code of honor, and then spent time on the laptops engaging with the source at their own pace. Ms. Villanueva’s English class was next, on the other side of the building. The 5 minutes between classes were punctuated with laughter and chatter as the students strolled to their lockers to get their materials for the next class. The 6th graders were about to start reading Roll of Thunder, Hear My Cry, a novel where characters are heavily affected by the racism of the time. To prepare for this, the students presented on different topics involved in the policies and practices of the day, including segregation of schools, the Jim Crow laws, and the disparate effects of the Great Depression on white and black families. The students had one more class before their first break in the day. I followed two students to their Algebra I math class with Ms. Rangoli, and took a seat. Academic Enrichment (AE) class followed, and it was very odd being in the students’ seat here. I am the AE teacher for the 6th graders, but today Mr. Betcher was the substitute. He had a light conversation with the students as they ate their snacks, asking them about their classes. The students called out the ones that were the hardest this year: History, Chemistry, Physics. In a survey I did a few days later with the students, I found that some of them also consider their hardest classes their favorites. Chemistry followed AE, and I decided to test out what remains of my high school chemistry education. The students around me were very patient with me! The student next to me showed me her notes as I pieced together the names of the chemical compounds. It was so valuable to me as a teacher to listen to the students puzzle out what made the most sense, learning from their mistakes and using and reapplying that knowledge as they moved forward with the practice problems. After that was everyone’s favorite time of the day: lunch! After a morning of nearly non-stop focus—whether moving around or seated—the students enjoyed some downtime. The 6th graders eat clustered in different parts of the cafeteria, always trying to sit with their group of close friends. They were eager to wave me over and include me in conversation as I migrated around and eavesdropped, and happy to answer my questions about their day so far, and where they were going after. I think this is such an important part of the day for them, and I’m so glad that 6th and 7th graders get to have a full 50 minute period for lunch and recess. My own middle school was much more restricted, and didn’t have a playground—we just had a 20 minute study hall, followed by lunch. This break in the day allowed them to relax and recharge. Many chose to do homework so they wouldn’t have to complete it all after school. The best part is that this lunch period is followed by their elective, a class which the students also view as a break in their day. Students get to choose an elective class at this age, which gives them time to study something that is genuinely interesting to them. I followed a group of students to Mr. Harter’s art class, where they were discussing the Baroque period of art history. The students discussed and analyzed a painting by Rembrandt, and then showed works of their own. This ‘critique’ part of the class has become a routine for them: the artist knows what kinds of descriptions are necessary to help their classmates understand the piece, and the audience knows what kinds of comments are most helpful. This kind of learning—feedback and re-thinking, without the pressure of a grade—is so important to foster growth mindsets, and I was delighted to see it in action. Dr. Dixit’s physics class followed art, and it was a rapid-paced, up-and-running classroom! The students took notes on the topic of energy and briefly reviewed a past quiz. I remembered more of my physics than my chemistry knowledge from high school, but that may be because I’d been lucky enough to have a teacher like Dr. Dixit in high school who made the lessons clear and engaging—with plenty of funny pictures in the examples! The last class of the day—for most students—was biology. This was the first day Dr. Sadrian was back in the classroom after her maternity leave, so it wasn’t a typical class for the sixth graders. Dr. Sadrian showed them pictures of her new baby and explained what was going to happen with the project they had been working on in class during her leave. The students were excited to see her—and just as excited to watch a video about how the body fights off disease. At the end of the day, some of the students move on to their second elective, while the rest head home or to our after school Late Bird program. I learned so much about what the students do to manage all of the demanded attention, but also how much they really do love learning—despite their frequent protests to the contrary. No longer a secret, sixth graders! We’re all BASIS Curriculum scholars here.